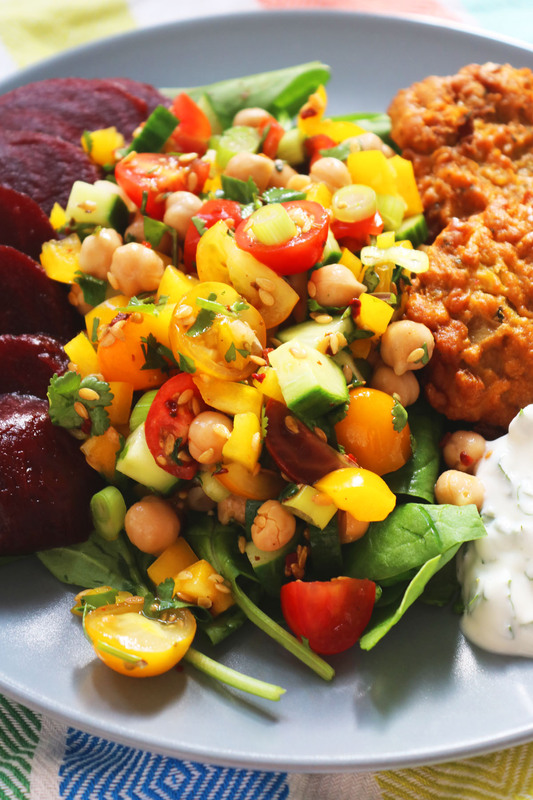 Cool off this summer with an Indian inspired chickpea salad. All the spice of your favourite curry without turning up the temperature in your kitchen. The wonderful thing about having a thriving herb garden is that you can easily turn simple, every day ingredients into something exciting. After a long weekend in Nottingham helping my sister move house, we returned home to a garden that had soaked up the sun and had a rather impressive growth spurt. Our curry plant in particular had gone wild. I wasn’t in the mood to cook. There was no way I was going to slave over a hob in the 30 degree heat so I had to get inventive. How could I use curry in something that wasn’t a curry? I raided my cupboards and fridge to find the makings of a simple salad: peppers, spring onions, cherry tomatoes and cucumber, a tin of chickpeas too. The plan was to combine all these along with some chilli flakes, fresh coriander and a splash of lemon juice to create a spicy chopped salad. 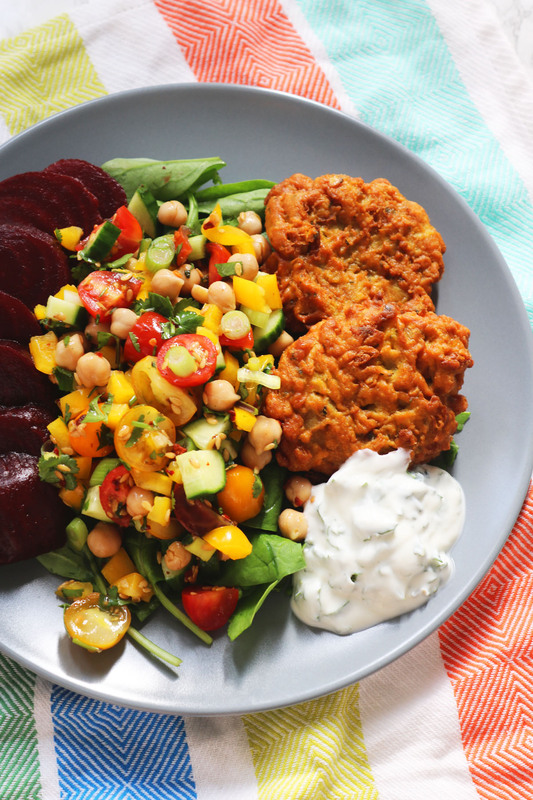 We served this Indian inspired chickpea salad on top of a bed of spinach and alongside some sliced beetroot and two onion bhajis. We also have mint growing in our lawn (don’t ask…I certainly didn’t put it there!) This was the perfect addition to some natural yogurt to make a raita. The finely chopped curry leaves really made this salad. They add wonderful aromatics and a hit of spice without using raw, ground, spices which wouldn’t be all that pleasant in a salad. I also added some hot chilli flakes though you could just as easily dice a few fresh chilli peppers if you have them to hand. I’ve stated how much chilli I used in the recipe but you may want to adjust this depending on the variety of the chilli you are using and your tolerance. The onion bhajis were served hot but you could also make this with cold leftover bhajis. The choice is yours! In a large bowl, combine the ingredients and toss together until all are coated in the spices and lemon juice. Serve alongside onion bhajis or tandoori grilled meats. I’ve suggested in the recipe that rather than serving alongside onion bhajis as we did, you could serve this with tandoori grilled meats but you can really serve it with whatever you like! We added extra beetroot and spinach on the side to make it the main part of the dish but it works just as well as a side. Why not give it a try and let me know what you think in the comments below. So simple, but you’ve dressed it up beautifully. Sounds delicious too. We’ve been mostly living on salads through the heatwave. I just couldn’t face cooking most of the time. Curry leaves sound interesting. I was a little bit unsure of them at first, we partly grew them just for their yellow flowers but they taste fab too! I feel your pain! Some are more hardy than others – our parsley has done SO badly. Even our rosemary is looking a little sad 🙁 the curry and mint on the other hand are thriving! This looks delicious, great for a no-cooking kind of day. Your comment on the garden mint made me laugh, that stuff is so hardy, and it spreads like wildfire! We dug up a huge area of it the other weekend and have tried putting it in one of the beds. Grass seed has gone down to try and regrown that area of lawn! There’s still mint everywhere though.